A section of the only surviving script in Shakespeare's handwriting. 2016 being the 400th anniversary of the Bard's death, many institutions are doing celebrations of one sort or another. The British Library, in hosting a major exhibition, has put online the only surviving scrap of a script in Shakespeare's handwriting — a scene that finds eerily poignant echoes in today's arguments about refugees and immigration on both sides of the Atlantic. It's a speech from a play, The Book of Sir Thomas More, that was not by Shakespeare. Nor was it produced in his lifetime, apparently for fear that it would incite unrest at a time of religious tensions that had created an unprecedented refugee crisis in Europe. 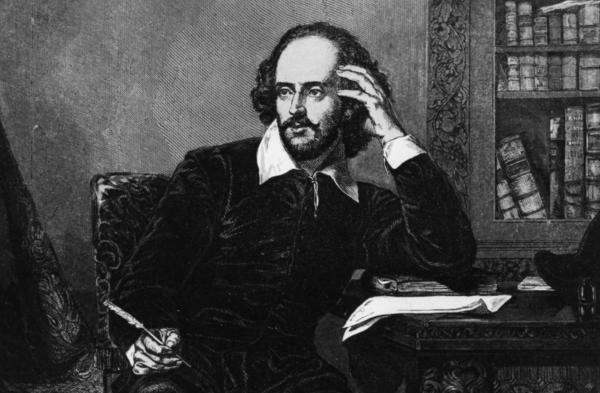 The Bard and several other authors did rewrites, but while his own contribution was an impassioned plea for tolerance, the revisions weren't enough to get the play produced, and its script languished for centuries. A part only partly written by the Bard, but powerfully so. In the stirring speech penned in Shakespeare's hand, it is More's task to silence a mob that's rioting about "strangers" in their midst. King Henry VIII had offered safe haven to too many refugees, scream the rioters. "They must be removed!" More begins by pretending to agree, then points out that there's a problem with mob rule when it denies clemency to the downtrodden. Though Shakespeare's handwritten revisions to The Book of Sir Thomas More qualify as a rough first draft, they do not lack for eloquence in decrying the mob's "mountainish inhumanity." Why, you must needs be strangers. 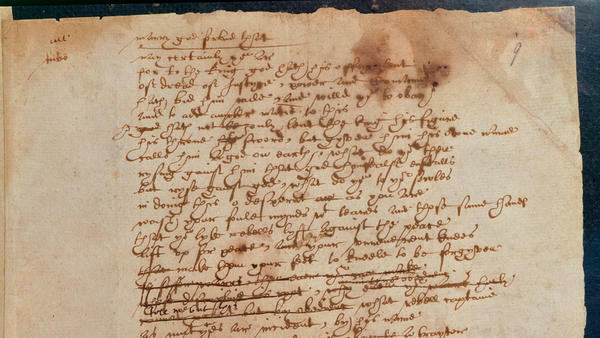 Shakespeare's original handwritten script is now on loan at the Folger Shakespeare Library in Washington. It is one of more than 300 texts being digitized as part of the British Library exhibition, Shakespeare in Ten Acts, that opens April 15 in London. Here's an unexpected voice on the topic of immigration reform - William Shakespeare. 2016 is the 400th anniversary of his death, so the British Library just put online the only surviving scrap of a script in Shakespeare's handwriting. It's from a play, "The Book Of Sir Thomas More," that was not by Shakespeare - he was called in to do the rewrites. NPR's Bob Mondello says what's striking about this scene the Bard wrote is how closely it's talk of refugees and immigration echoes arguments today. BOB MONDELLO, BYLINE: "The Book Of Sir Thomas More" was never presented on stage in Shakespeare's time for fear it would incite unrest. Religious tensions had led to an unprecedented refugee crisis in Europe. And while the Bard's own contribution was an impassioned plea for tolerance, that didn't get the play produced. It languished for centuries. When it was finally staged in 1964, a young Ian McKellen played Sir Thomas More, a fact that's allowed him, in speaking engagements recently, to make this little joke. IAN MCKELLEN: I'm the - maybe the last actor who can say I created a part written by William Shakespeare. MONDELLO: A part only partly written by the Bard, let's note, but powerfully so. In the three-page scene that's in Shakespeare's hand, it's Sir Thomas More's task to silence a mob that's rioting about strangers in their midst. The king has offered safe haven to too many refugees, screamed the rioters. Folks of different colors, different cultures - they must be removed. Fine, says More. MCKELLEN: (As Sir Thomas More) Grant them removed. Imagine that you see the wretched strangers - their babies at their backs with their poor luggage, plodding to the ports and coasts for transportation. And that you sit as kings in your desires, authority quite silenced by your brawl, and you in rough of your opinions clothed. What had you got? MONDELLO: What they got, he tells them, is the rule of the mob. And if the mom turns? MCKELLEN: (As Sir Thomas More) Not one of you should live an aged man, for other ruffians, as their fancies wrought, with self same hand, self reason and self right, would shock on you - and men, like ravenous fishes, feed on one another. Oh, desperate as you are, wash your foul minds tears. MONDELLO: Then he suggests they imagine that they're the ones looking for a safe harbor. MCKELLEN: (As Sir Thomas More) Would you be pleased to find a nation of such barbarous temper that breaking out in hideous violence would not afford you an abode on earth? Spurn you like dogs, and like as if that God owed not, nor made not you, nor that the elements were not all appropriate to your comfort, but chartered unto them - what would you think to be thus used? MONDELLO: Though Shakespeare's handwritten revisions to "The Book Of Sir Thomas More" qualify as just a first draft, they do not lack for eloquence, especially in their final, disapproving line. MCKELLEN: (As Sir Thomas More) This is the strangers' case and this, your momtainish inhumanity. MONDELLO: Shakespeare on immigration reform, a little over 400 years ago - his handwritten script is now on-loan at the Folger Shakespeare Library in Washington. I'm Bob Mondello. Transcript provided by NPR, Copyright NPR.